I recently received an email from my niece relating how the spiders took over her condo while she was away. The final straw was when she discovered (with her face) a spider web across the door between her condo and garage. Regardless of how you feel about spiders and their chance for survival, in this instance, you have to admire their resourcefulness. Even though my niece is petite, had they been successful, they would have had enough for three square meals a day for a year. This made me think about bugs in general. Despite all of our insecticides, sprays, crop dusters, not to mention fly traps, swatters, zappers, and strips. No bug has ever been reported as extinct or even on the endangered species list. I understand that scientists had not seen a certain bumble bee (Bombus occidentalis) for about ten years, but it turned out they were on vacation in Mexico and have since relocated to a park north of Seattle, Washington. Personally I doubt that any insect will ever become extinct until someone discovers how to harvest, skin, and make ladies’ purses and shoes out of their hides. Since we have horses, despite my best efforts, we will always have flies. I spend probably two hundred dollars a year in fly control alone. Besides other measures, I use eight to ten fly traps a year, each one of which traps and drowns approximately 40,000 flies, so I am responsible for the deaths of 320,000 to 400,000 flies every year, yet there still seems to be an endless supply. If I could get even half the people of Arizona to trap the same number of flies each, I’m sure we would put a serious dent in the population. He’s the guy who sits outside the door to your house or car for hours just waiting for you to open it and then zips inside. He then spends the next three days banging his forehead against the windows trying to get back out. If he’s inside your car and you roll down all four windows he won’t go near any of them, he will only attack windows that won’t open. It’s almost like he knows that if he flies even close to one of those four 80 mile per hour vortices it will rip his little wings off. Another bug I’m not too fond of is the scorpion. I might feel differently if they served any useful purpose, but even though a certain car manufacturer, in its commercials, would like to convince us that scorpions steal bras from sun-bathing super-babes, I doubt that’s the case. 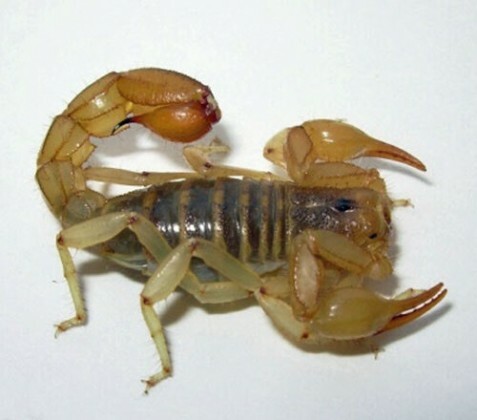 My feud with scorpions started a few years ago when I put on my work boots and mashed a scorpion inside the boot, under my heel. Since I wasn’t stung, it could have ended worse (except for the scorpion). However, it looks like they’ve been out for revenge ever since. Since they eat mostly bugs, and except for the occasional door watch fly, cricket, or spider, our house is (compared to outside), relatively bug-free, they have no other reason to come inside. This vendetta reached a peak a few years later when I was sleeping about two in the morning and felt a bug on my shoulder which I brushed away. The scorpion retaliated by stinging me on my pinky finger, an experience similar to a combination of cattle prod and red-hot poker. He lost a leg in the encounter, and when I followed the blood trail, found him skulking under my pillow where I dispatched him to the scorpion great beyond. By 8 am, the pain had traveled all the way to my scalp. I could count my teeth by simply concentrating on the unique pain in each one and for two weeks I had the same amount of feeling in the pinky as an Oscar Mayer jumbo wiener. I consider this attack a dastardly deed, and have established, by the use of a black light, welder’s gloves, and billy club, a ten foot kill zone around my house, where they will have to crawl over the bodies of their fallen brothers to get to me.